COSMIC THURSDAYS, a series of public and free talks on astronomy subjects continues during Spring 2016. The talks are designed with the general audience in mind, they are fun, easy to understand and engaging. A brief summary will be given of the history of research on supermassive black holes and some of the most important questions that astronomers have studied since their discovery in the 1960s. Also, a review of recent discoveries that indicate that black holes may play a pivotal role in the way galaxies grow will be presented, together with current research. 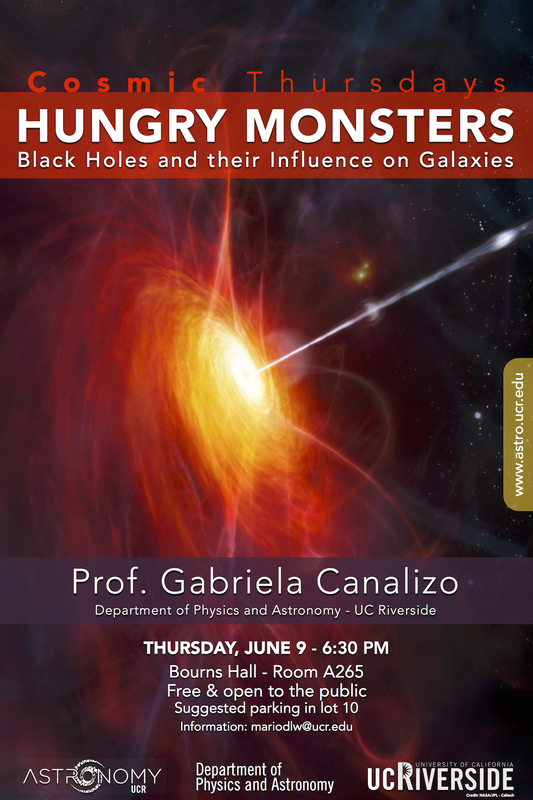 Prof. Canalizo has been involved in understanding the relation between active black holes and galaxy collisions. Talks will resume in October 2016.